Through the years, Frankenstein has proven to be a favorite subject for television anthology shows. Guest Blogger Marc Berezin reviews an intriguing and rarely-seen British adaptation from 1968. It’s generally assumed that the first Frankenstein film attempting a fidelity to Mary Shelley’s original story was the 1973 Dan Curtis/ABC-TV version. However, that distinction ought to go to another small-screen version that preceded it by a few years. Mystery and Imagination was a gothic horror anthology series broadcast on British ITV stations from 1966-68 and 1970 and produced (in black and white) first by the Associated British Corporation Television and then by Thames Television. The 71-minute November 11, 1968 episode was an adaptation of Frankenstein, written by Robert Muller and directed by “Voytek” (Voytek Roman). For the first time, the doomed characters of Clerval (Neil Stacy), Justine (Meg Wynn Owen) and young William (Frank Barry, here called “Wilhelm”) were portrayed close to Shelley’s text, and Elizabeth (Sarah Badel) finally is really murdered by her husband’s creation. Nevertheless, as in the 1973 and 1984 telefilms, the low budget videotaped nature of the production precluded a trip to the North Pole. This rendition is also noteworthy for its own distinctive take on the Frankenstein mythos. The close identification between Creator and Creation had already been touched on in previous adaptations, such as the 1910 Edison film where The Monster is a manifestation of Frankenstein’s baser nature; the mirror comparison scene in Son of Frankenstein (1939); Frankenstein 1970 (1958) in which the Monster is revealed at the end to resemble a younger version of the scientist, and Revenge of Frankenstein (1958) where the doctor becomes his creation. Further reflecting the popular confusion of the name "Frankenstein”, the 1927 Peggy Webling play had the creator intentionally share his name with his creation. All this is now taken a step further: both Victor Frankenstein and “the Being” (so named in the credits) are portrayed throughout by one actor, Ian Holm. The Being’s facial makeup consists of a disfigured left side (resembling a bad skin condition) along with forehead stitches, but still he appears nearly identical to Victor. The Being is assembled in a rather sparsely furnished lab with the aid of a hunchback named Fritz (Ron Pember, in a nod to the 1931 film). Victor is upfront in his challenge to God, whom he wishes to “meet on equal terms”. Indeed, he clearly usurps the role of Deity by fashioning his man in his own image. Another distinction is the blind man sequence. Whereas all other versions depict encounters with a sightless person as idyllic until broken up by sighted intruders, here the Being itself sours the relationship when it asks, “Who is God?” Informed by the blind elder (Gerald Lawson) that “God gave each of us the gift of Life”, it recalls its own errant creator and declares: “God…bad!” This blasphemy so upsets the pious host that his returning son needs little provocation to drive the now unwelcome visitor away. The Being then walks into the shadows in an ambiguous fadeout. On the whole, this version of Frankenstein is well-executed and enjoyable to watch. As noted earlier, it is hampered by the budget — there are few outdoor scenes — but makes successful use of split photography and body doubles to create an illusion of the two characters interacting with one another. There is also an effective use of a heartbeat on the soundtrack, warning us of the Being’s approach. 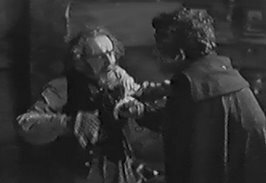 Holm, who would play the scientist’s father 26 years later in Mary Shelley’s Frankenstein (1994), is a fine actor in both roles, but lacks the physically imposing stature that would make the Being more frightful. Since the light makeup is designed so that the creation be identical with the creator, it is difficult to imagine how the public at large would be terrified by what basically looks like a disfigured version of the diminutive Holm (the being is frequently filmed from the ground up to create an illusion of height). Furthermore, other than Frankenstein’s rejection and the disastrous encounter with the blind man, the audience is not shown how the Being becomes a vengeful killer — no irate villagers, not even having stones thrown. Only about eight of the original 24 episodes of this well-crafted series survive. The few that do, including Frankenstein and the Denholm Elliot-starring Dracula, have circulated among collectors as grainy unauthorized videotapes and DVDs. It is well worth searching out reliable sources for these highly recommended items. UPDATE: The surviving episodes of Mystery and Imagination, including the Ian Holm Frankenstein reviewed here, are to be officially released on DVD in the UK on March 23, 2009. Here’s the Amazon UK link. Mystery and Imagination series IMDB page, episode guide, and an article on Television Heaven. Frankenstein episode IMDB page. Marc Berezin is our first returning Guest Blogger. He previously contributed The Patchwork People of Oz, a fascinating survey of Frankensteinian characters in the stories of L. Frank Baum. Good post.actually,i too have always wondered why every version which attempts to be faithful to the novel has a marginally disfigured monster,even in the FRANKENSTEIN:THE TRUE STORY mini-series the creature is handsome at first,i mean it's not like the creature in the book was an adonis or somenthing!,in fact the novel's description,with the shrivelled face,rotten,translucent yellow skin,long black hair,black lips,sounds far more gruesome to me than any of Hollywood's depictions of the monster!,my guess is that it's just done to break mold with the Pierce design,but even Hammer was more creative,and they never used that design except 2 times!. I think that "name" actors (like Robert DeNiro, David Warner, and Randy Quaid or Bo Svenson and Michael Sarrazin in the early 70s) are reluctant to cover up their faces. And while FRANKENSTEIN: THE TRUE [sic} STORY took a number of Shelley concepts, it introduced many more new things into the story. wow, what a find! ian holm as frankenstein??? I would be very interested in getting a copy of any episodes availble, does anyone have them? Please contact me at karswell@hotmail.com if you'd like to trade or sell a copy. Thanks! Add me to the list of people who a) had no idea an Iam Holm Frankenstein existed and b) are now absolutely DESPERATE to view it! I love the creator/creation as doppleganger idea, and the "God...bad!" line is going to be my new ringtone if I can find a copy of this show. Thanks for this! Very awesome! I think once the template for a movie Frankenstein was established, it was hard for producers to risk a Creature who in some way didn't look monstrous. And I love the idea of a short monster! BTW Arbogast, I attended a stage production of "Frankenstein" with a short Monster, and that aspect sure worked against the story's effectiveness! Has anyone seen this again recently?? I watched it at age 12 in 1968 and was pretty creeped-out, but most strongly remember Ian Holm shouting "Ring your damn church bells for ME!!" Did I mis-remember this for 40 years?? Thanks! Ring your God's holy bells!